Batman Arkham Asylum Series 2 Action Figure SET There is NO packaging condition guarantees on this set, due to the requirement of shipping it...but in our opinion... this set is in impeccable condition and the price reflects this!! Batman Arkham Asylum Series 2 Action Figure SET:From the critically acclaimed Rocksteady studios' game, Batman: Arkham Asylum. Featuring character designs from the game!The inmates are running this madhouse!It's a madhouse... and the lunatics are running the asylum! This Series 2 set of 4 action figures, individually packaged, contain the following: 1x Poison Ivy1x Zsasz 1x Batman (Armored)1x Bane (production shortage, this SET is Blazing HOT! )After arriving on Arkham Island, Batman is greeted by Warden Sharp and security personnel. Although The Joker is securely strapped to a handcart for transfer to the deepest bowels of Arkham, he escapes nonetheless. This is going to be the worst night of Batman's life. With The Joker free, inciting unrest among the inmates, Batman faces a riot from a cadre of Gotham City's most wanted: killers and psychopaths who are screaming for vengeance and out for blood. Batman's blood. His mission? Stop The Joker- and his accomplices- at all costs. Welcome to the asylum. Arkham Asylum. 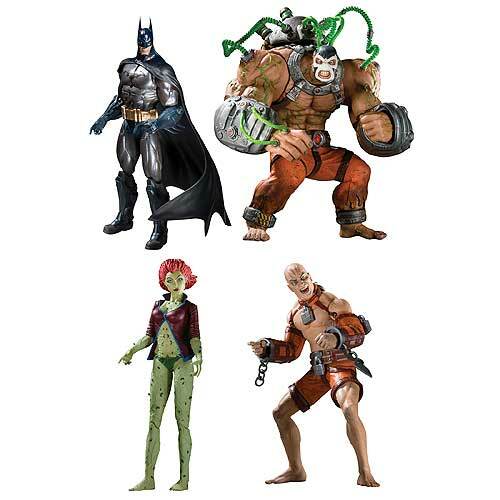 The Arkham Asylum Series 2 figures are based on the game designs of the "Most Critically Acclaimed Superhero Game Ever." All four figures feature multiple points of articulation and include a display base. Character-appropriate accessories are also included along with 4-color clamshell blister card packaging. Figures range from 6 to 6 3/4-iches tall.